Hungary’s largest circulation national daily newspaper, Magyar Nemzet, announced that it is ceasing publication–both in print and online. A few hours later we learned that a 26 year old politician whose mother happens to be Viktor Orbán’s ally and historian, has the millions of euros at his disposal, through a family inheritance, needed to buy the country’s main daily newspaper, along with a weekly and a radio station. The conservative publication, owned by Lajos Simicska, is citing financial problems as the reason for the closure. The daily was established 80 years ago and in the last four years, it transformed from being a loyal and unwavering media organ of the Orbán regime to a quality conservative publication that was critical of the government. Both conservative and liberal columnists published opinion pieces in Magyar Nemzet, but the paper’s owner, Mr. Simicska, and many of the journalists gravitated mostly to the now more moderate Jobbik. Mr. Simicska is also shutting down his conservative talk radio station, Lánchíd Rádió. 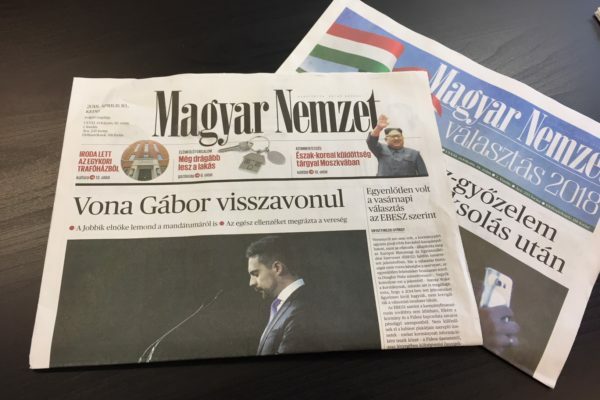 Magyar Nemzet, with the news of Jobbik leader Gábor Vona resigning on its cover. His news television network, HírTV, will continue broadcasting for now, but its future beyond 2019 is uncertain. HírTV’s broadcasting license is up for renewal at the end of 2019 and given Viktor Orbán’s two-thirds majority victory and his personal, acrimonious conflict with Mr. Simicska, it seems all but certain that Hungarian authorities will opt not to renew HírTV’s broadcast license. The conservative Heti Válasz weekly is also on the verge of ceasing publication. After reports that the magazine will shut down unless it finds a buyer, Editor-in-chief Gábor Borókai published a brief statement. Mr. Borókai confirmed that his publication is being boycotted by key Fidesz politicians and those in charge of government communications. As such, the upcoming Thursday issue only includes reactions from people outside this group. “We truly hope that this absurd world will come to an end and that the victorious Fidesz will return to a state of normalcy,” said Mr. Borókai. Some of our readers will know that Mr. Borókai was the spokesperson of the first Orbán government (1998-2002). 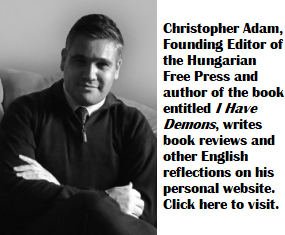 Today, he too is more or less a persona non-grata in government circles, as he allows for critical commentary of Fidesz in what is otherwise a pretty solidly conservative publication. Why Mr. Borókai hopes for a return to normalcy eludes me. In the murky world that is Hungarian politics, Politics Can Be Different (LMP) politician Péter Ungár is offering to personally buy Heti Válasz, Magyar Nemzet and Lánchíd Rádió. The 26 year old Mr. Ungár is the son of Fidesz court historian Mária Schmidt–one of Viktor Orbán’s most vocal supporters–and if the deal goes through, he will become a media magnate in Hungary from one day to the next–even though he is barely out of university. Of course, this family connection should not necessarily mean that Mr. Ungár does not have political opinions of his own, independent of those of his mother. The only problem is that his behaviour during the election campaign itself, as an LMP politician, was problematic. For instance, he was steadfastly opposed to cooperation among opposition parties at the riding level–cooperation that everybody knew was necessary to remain competitive against Fidesz and without which LMP had no chance of winning a single riding. One of his colleagues in LMP, Ákos Hadházy, recently suggested that there are Fidesz agents within his party, though he offered no names. Earlier, in the summer of 2017, Péter Ungár attended a festival organized by another opposition political party, Momentum. During the festival he became intoxicated. Mr. Ungár engaged in repeated acts of sexual misconduct. He molested multiple women during the event and on at least one occasion refused to stop his sexual advances, even after the woman involved indicated that they were unwanted. Mr. Ungár was expelled from the festival by security guards, Momentum was outraged by this behaviour and he later apologized for the incident, offering to also apologize in person to all those impacted by his conduct. The women, however, decided not to press charges. 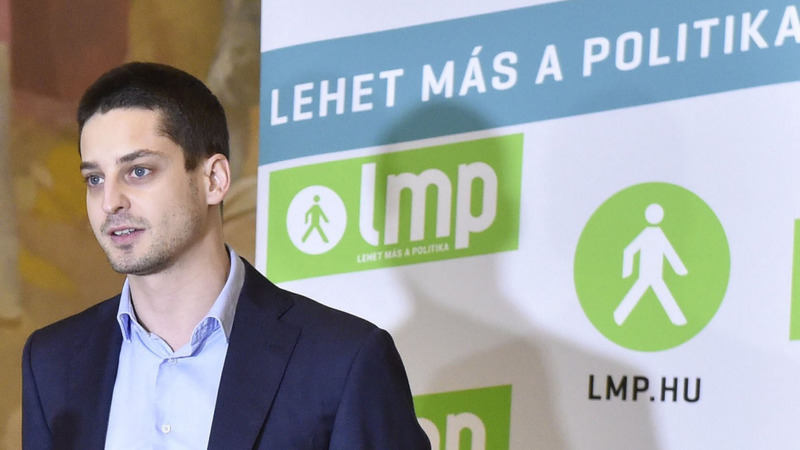 To the surprise of many, LMP refused to remove Mr. Ungár from the party’s leadership. The fall-out from Election 2018 continues. The Moor has done his duty. The Moor can go. – A mór megtette kötelességét, a mór mehet. Mr. Simicska doesn’t need the mentioned grossly unsuccessful media anymore as he is one of the biggest losers of the Sunday election. He drops his loyal backboneless servants like hot potatoes and lets them go to find a new puppet master. He is done for at least three years with politics. He will revert to grabbing more money from the Hungarian economy. I will shed a tear for all of them when I have some extra time.